Wow, my wife, two friends, and I did a great urban walk the other day. Unusual views of Seattle. A nifty little Japanese garden from 1914. And, an unusual tree. 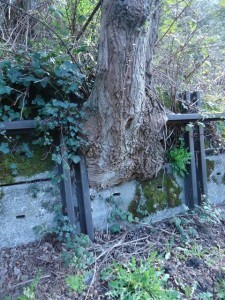 As you can see from the photo, the tree has been pierced by a trolley car track. We found the tree on 13th Avenue South between Beacon Avenue and South Lander St, on the western edge of Beacon Hill. It’s a strange little street, which dips down to a low point from either end. I suspect that a stream once ran down the valley, flowing west off Beacon Hill to the former Duwamish River tide flats below. Judging from a flight of steps that drops to the west, the area is quite unstable. Unlike stairs on a stable slope, these tilt to the left as you descend. Plus, water flowed across the stairs, a sign of a seep, most likely a contact zone between the underlying Lawton Clay and Esperance Sand. We also saw seeps near the strange tree. It was a Lombardy Poplar, a tree often planted as a wind block, shade tree, and ornamental. They grow quickly and very tall. On 13th Ave, they shared the slope with Bigleaf Maples, a common native tree that colonizes unstable slopes around Puget Sound. Someone also has tried to stabilize the slope by erecting a retaining wall at the bottom of it. 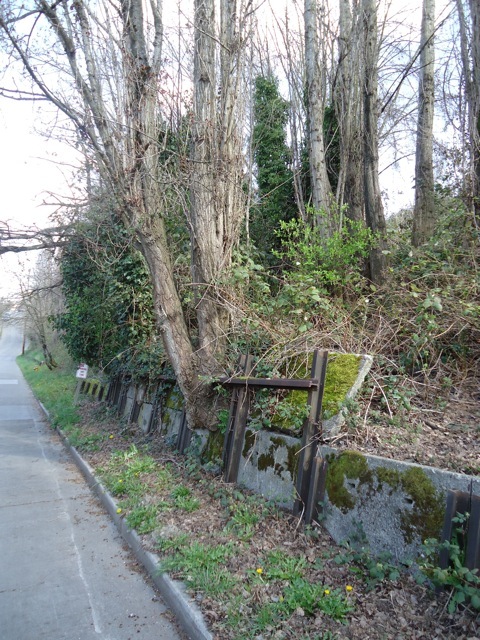 As happened in many green spaces in Seattle, the slope stabilizers took advantage of a change in Seattle’s once incredible system of street car trolleys. Twenty two different, independent trolley lines once plied the streets of Seattle. By 1936, after consolidation, there were 410 streetcars on 26 routes, but the system was not a moneymaker and much of it was eventually torn out of the streets. The rails and concrete slabs between them did not go to waste; they were used widely across Seattle to build stairways up and down city hills. The concrete slabs became the steps and the rails became handrails; it was quite an ingenious and resourceful way to use the abandoned material. According to the recently published Seattle Stairway Walks by Jake and Cathy Jaramillo, the city built about 130 flights of slab and rail stairs. The practice appears to have stopped about 1965. On 13th, however, the slabs and rails were used for the retaining wall. So sometime after 1965, either someone planted several Lombardy poplars on 13th or several invaded “naturally.”As one of them thrived, it grew around the old trolley rail, making for quite a nifty illustration of urban natural history.